Our rowers of FINNLO! 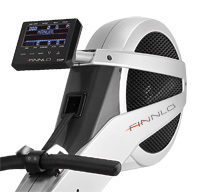 We will introduce the three models a little closer here: the rowing machine FINNLO Aquon XTR 2, the Aquon Pro and also the Aquon Pro Plus with all their details are compared. Further information on technology of rowing machines or videos can be found on our other pages. We also prepared for you exciting training tips from our professionals and client opinions and reviews. Developed and used by professional rowing athletes, world champions and gold medalists. The choice of professionals! Rowing training with the FINNLO Aquon Pro Plus promotes endurance and strength equally, so the body is perfectly defined with only one form of training. The realistic rowing supports the cardiovascular system, builds up muscles, and effectively prevents back problems. What makes the Aquon Pro Plus special: The training resistance can be adjusted directly on the handlebar. The intensity of the workout can be optional adjusted between 30 and 300 watts. The load control is very precise due to the premium resistor technology used in the Pro Plus Aquon. Accordingly, the Aquon Pro Plus is an Ergometer of Class SA (according to DIN EN 957 - 1/7). The resistance control is made via computer and is realized using the high-end black backlight display. Alternatively, the intensity can be set directly on the handlebar. So you do not have to stop during your rowing motion to set the computer, you just continue the training comfortably. 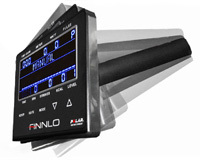 This makes the Aquon Pro Plus rowing ergometer unique in competitive comparison. In correspondence with the blue digital display, which shows 11 power levels permanently, the exercise monitor is very clear. Especially with an intense workout, it is important to always being able having an eye on the display to check the rowing section and the performance. This is realized due to the continuous inclinable display which is well visible from any rowing position. The side arm of the computer is longer, compared to other rowing machines on the market, so that the training data are always well visible during the whole rowing motion. 4 racetracks (competition programs against the computer) provide you a daily challenge, varied training and fitness fun at home. The training against the computer allows you an almost unconscious, but particularly effective way of constantly increasing the performance. One of the competition programs can be individually programmed and adapted to your own needs. Thus your training options are almost unlimited. The well-proven and unique combination technology of magnetic and air resistance is used with all top machines of FINNLO. This technique gives you an absolutely real rowing experience, because the intensity increases as a function of training speed and traction. This intensity profile is generated by the integrated wind wheel and reflects the feeling of rowing on water exactly. At the same time the trainee feels the upcoming air vortex like airstream and so receives a refreshing cooling. The air flow can be switched on or off via a sliding mechanism. The brake system is completed by the magnetic resistance. Even with low pull power, high braking force can be achieved in this way. The resistance systems complement each other perfectly and provide the FINNLO typical smooth and long-lasting quiet movement. The aluminum roll bar can be placed vertically with its built-in folding mechanism. As a result, the rowing machine can be stored well in tight spaces. In addition, the transport rollers facilitate maneuvering in a room. Even in bad weather or in wintertime it is possible to workout besides watching ones favorite TV show. You just move your rowing ergometer Aquon Pro in front of your TV, swapping your TV chair with the comfort seat of your rowing machine and off you go. You save time and also support your health besides. The ball-bearing seat is very comfortable and is on a professional seat height of 50 cm. This creates a natural rowing feeling, a smooth motion and also facilitates entry and exit. The footrests can also be adapted to different shoe sizes. The footrests distance of Aquon Pro Plus rower is only 9 cm. This makes the rowing motion especially ergonomic and reminds of professional rowing boats.